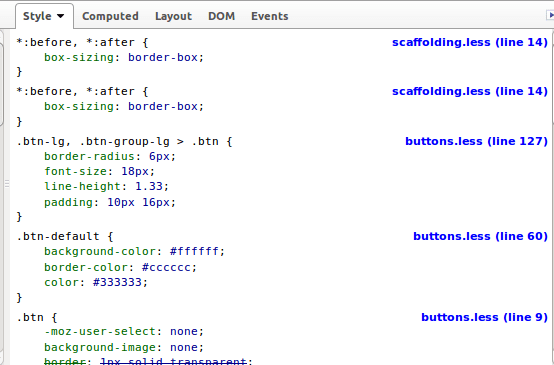 So for people who develop their Less code in browser FireLess can replace the CSS sourcemaps functionality for now. The Firebug add-on integrates with Firefox to put a wealth of development tools and FireLESS in a browser add-on for FireFox that allows Firebug to display the original LESS file name and line number of LESS-generated CSS styles. Currently requires a patched version of LESS available at …. As you can see, each URL seems to start with file\:\/\ (back slashes used for escape). The file\:\/\ prepended to the file path seems wrong (this issue has been fix in release 2.3.0). Also the values set for the font-family property are not surrounded by quotes. There will be no need to writing a patched version to fix these issues since version 2 Less. Less v2 enables you to write easily a plugin. 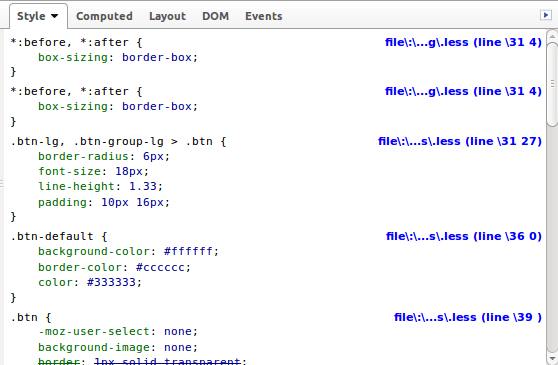 A postprocess plugin, which modify the compiled CSS code, can be used to correct the already mentioned issues. I have tested the plugin code above only on Linux, when you are on a Windows machine for some reason, you should possible need more or different fixes for the file paths.